How do you turn the classic game of ring toss into an aerobic activity? Add some sticks and take it to the skies. RingStix is a soaring new outdoor game that’s played with flying discs and sword-like launchers. Basically, two people pass a ring back and forth using two sticks per player. The person tossing the ring threads both sticks through the ring, then quickly pulls the sticks apart to launch the ring. 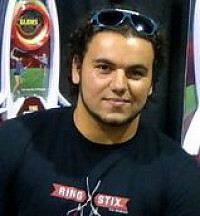 The receiving player uses one or two sticks to catch the ring. The tricky part is getting a feel for the sticks, but it doesn’t take long to get the hang of it. As you get better, you can speed up your launches, try new tricks, and create games of your own. 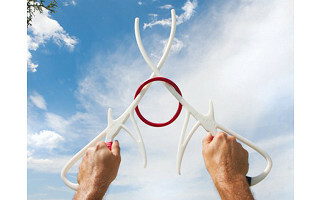 RingStix is an eye-catching game that can liven up any trip to the beach, park or backyard. You can play it with two people, or combine sets to get a whole gang tossing rings. You can play it in the water (the rings float), and you can play it solo by shooting the ring straight up and catching it. Each set comes with two pairs of sticks with molded grips, one red ring, one glow-in-the-dark ring for nighttime play, and one carry bag. Running around and tossing/catching rings is great exercise, plus it’s fun. All you need to get started is a partner and an open area for play. Ready, set, fling a ring! Hello to all the Daily Grommet fans, my name is Arti and I have been with RingStix since the beginning and have seen the evolution of this game. I knew from the time I saw the first samples that it would be a hit. The game is so much fun and like nothing you have ever seen before. I’m excited that Daily Grommet has chosen to share this cool game with you all and I would be more than happy to answer any questions you may have. This game has to be played in a lot of open space. I can see you might skewer someone if they are too close. No brainer. huh? The game is designed to be played from 10+ yards, and as far as skewering, the Sticks are not sharp and they are quite flexible. How about dialing back on the negative and assumptions and instead enquire before "skewering" yourself? I think these look cool and am going to order a set for the beach. Looks interesting. About how far can the rings go if you really let it rip? do the rings tend to fly more like a frisbee or do they fly more vertically? once you have gotten the hang of it and you really let it rip these will go up to 50yards. or about 100 ft straight up if you are tossing it to yourself. The idea is to get the ring to fly parallel to the ground to make it easier for your playing partner to catch it. You're going to HAVE to redesign that so that neither side has a sharp end. Doesn't matter how 'pliable' it is, it's an eye hazard at least. If you don't believe me, ask a consumer oriented lawyer or a pediatrician. you can't really see in the pictures Dawn but these are flat at the ends not pointy. @ Dawn do you wear mittens all the time? Because your fingers are very dangerous and could put an eye out. Mr. Radani, these look like fun, not for me, but I wish you and your company well. You must be from generation "X" because that is the generation always worried about the worst and lawyers. I guess I am a "Baby Boomer" generation because I think about having fun, not suing somebody but for my negligence or an accident. When I was a kid I played in the woods all the time. I played out in the barn who someone else rented and filled with bales of hay. Me and my brothers would climb to the top, almost to the barn roof, and jump into the loose hay on the floor. Dangerous? Of course! Fun! Absolutely!! We were never hurt but if we had been it would have been on us, an accident, and my parents would not have been looking for someone else to blame or sue. I miss the "good ole days"! If you have younger kids playing offer some help until they get the hang of it and otherwise everyone should have a great time. How do you turn the classic game of ring toss into an aerobic activity? Add some sticks and take it to the skies. RingStix is a soaring new outdoor game that’s played with flying discs and sword-like launchers. Basically, two people pass a ring back and forth using two sticks per player. The person tossing the ring threads both sticks through the ring, then quickly pulls the sticks apart to launch the ring. The receiving player uses one or two sticks to catch the ring. The tricky part is getting a feel for the sticks, but it doesn’t take long to get the hang of it. As you get better, you can speed up your launches, try new tricks, and create games of your own. 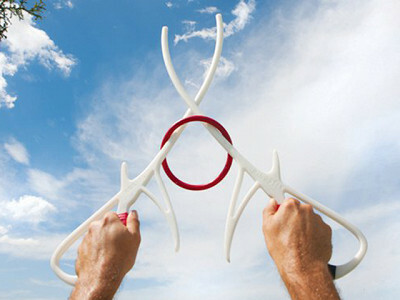 RingStix is an eye-catching game that can liven up any trip to the beach, park or backyard. You can play it with two people, or combine sets to get a whole gang tossing rings. You can play it in the water (the rings float), and you can play it solo by shooting the ring straight up and catching it. Each set comes with two pairs of sticks with molded grips, one red ring, one glow-in-the-dark ring for nighttime play, and one carry bag.